Our coaster wedding favors are truly unique and so useful! These favors will be great for your wedding reception. High quality, heavy duty coasters, your guests will love taking them home and using them! These will look lovely placed on tables, with your favorite beverage sitting on them, while protecting your tables. They will be a wonderful reminder of a wonderful day! Enjoy a great selection of these very practical favors that your guests will keep and always remember your wedding each time they use them. 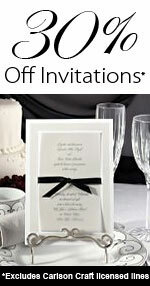 A great gift to make your wedding a very special moment.